Not every must-see musical translates well to the big screen. Case in point: the hit jukebox musical “Mamma Mia!” Despite being an absolute joy to watch onstage, when Universal Pictures adapted the West End musical based on the music of ABBA for the big screen in 2008, many theatergoers felt the feature film didn’t come close to doing it justice. Not only were some roles severely miscast (sorry Meryl Streep), but several of the musical numbers were awkward to watch—and in some cases, hard to listen to (sorry Pierce Brosnan). 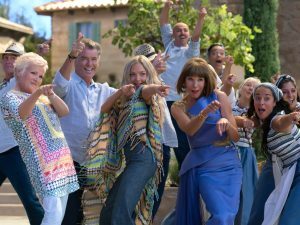 Still, enough ABBA fans saw the big screen adaptation of “Mamma Mia!” for the movie to make a lot of money and now, 10 years later, there’s a sequel. Of course, this time around there’s nothing to compare the movie to since there’s no stage version of the material—and that’s a good thing. “Mamma Mia! Here We Go Again” reunites viewers with most of the original cast as Sophie (Amanda Seyfried, “Big Love”) gets ready to reopen her mother Donna’s (three-time Oscar winner Streep, “The Iron Lady,” “Sophie’s Choice,” “Kramer vs. Kramer”) hotel and continue to fulfill her dream of making the dilapidated building she once discovered on the Greek island of Kalokairi after graduating from college a beautiful tavern. Unfortunately, not everyone can make it out to the grand reopening. While Donna’s lifelong besties, Rosie (Julie Walters, “Billy Elliot”) and Tanya (the scene-stealing Christine Baranski, “Cybill”), are there and Sophie’s stepdad/one-third of her real dad, Sam (Brosnan, “Tomorrow Never Dies”), Donna is absent for a reason that won’t be spoiled here (although it can easily be guessed from the film’s trailers). Also missing from the celebration is Sophie’s love, Sky (Dominic Copper, “Preacher”), who is contemplating leaving Kalokairi—and Sophie—to take a job in Manhattan, and Sophie’s other two fathers, Harry (Oscar winner Colin Firth, “The King’s Speech”) and Bill (Stellan Skarsgård, “Good Will Hunting”), who had prior engagements they couldn’t get out of. Rather than sticking to the present-day storyline, however, “Mamma Mia! Here We Go Again” frequently flashes back to tell the story briefly discussed in the first film of how Donna met Sophie’s three potential dads. Audiences finally get to see a young Donna (played perfectly by Lily James, “Cinderella”) fall for Harry (Hugh Skinner, “Les Misérables”), Bill (Josh Dylan, “Allied”) and Sam (Jeremy Irvine, “War Horse”) as well as the scenic Greek island that ultimately stole her heart. While the flashback scenes are enjoyable to watch for the most part, they also serve as a constant reminder of just how thin the plot is of “Mamma Mia! Here We Go Again.” Screenwriters Richard Curtis (“Four Weddings and a Funeral”), Catherine Johnson (“Love in the 21st Century”) and Ol Parker (“The Best Exotic Marigold Hotel”)—the latter of whom also directed the film—are merely killing time while viewers wait to see who really makes it to Sophie’s party by telling fans a story they already know, just this time scored by different, less popular ABBA tracks. Sure, some favorites like “Dancing Queen” and “One of Us” are recycled, but for the most part, the movie isn’t as much of a sing-along experience as the first one since, minus “Fernando,” the songs aren’t quite as familiar. Fortunately, since the actors’ voices likely won’t be drowned out by audience members singing along, this time around the singing is left more to the actors who can sing than those who can’t. Both Seyfried and the effervescent James can carry a tune, so they perform most of the tracks. Truth be told, all of the women in the movie can sing fairly well, it’s the guys who are still a little hard to listen to—particularly Brosnan and Cooper. By the time Sophie’s absentee grandmother Ruby (Oscar winner Cher, “Moonstruck”) shows up to the island to tell Sophie that she wants to be a grandma after all these years—only to discover she’s about to become a great-grandmother—“Mamma Mia! Here We Go Again” is finally an enjoyable film to watch. It even manages to surprise audiences by getting a bit emotional at the last minute, letting Donna and Sophie have yet another poignant “Slipping Through My Fingers”-type mother-daughter moment like in the first film. Ticket holders will likely leave the theater with a smile on their face and possibly wiping some tears from their eyes—it just takes far too long for audiences to find the joy in a movie that’s based on such an entertaining, euphoric musical. Nevertheless, while “Mamma Mia! Here We Go Again” still pales in comparison to watching the stage version of “Mamma Mia!,” it is definitely an improvement on its cinematic predecessor. Audiences may leave the theater with some questions—particularly in regard to what happened to Donna—but the singing is better even if the songs aren’t, the casting is better (particularly James as a young Donna, “Harlots’” Alexa Davies as a young Rosie and “Forever’s” Jessica Keenan Wynn as a young Tanya), there’s a handful of genuine laugh-out-loud moments and there’s Cher in all of her campy glory. ABBA fans might not have the time of their lives watching the film, but they will eventually have a good time. 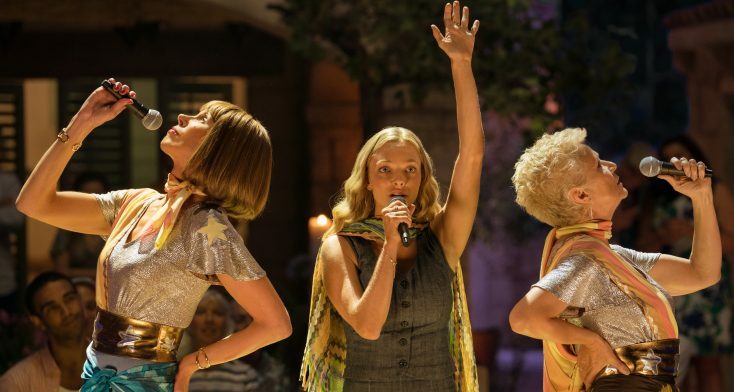 For those who aren’t fans of the original “Mamma Mia!” or ABBA’s music, though, you’re probably best sitting out this sequel.